Last week I wrote my first entry for “Solo Shots,” an effort to tell the stories of Orioles players since 1954 who finished their careers with one home run while wearing orange and black. Jim Brideweser (1954, 1957) was up first. This week Bob Hale is the focus. Robert Houston Hale played for the Orioles nearly 20 years before the designated hitter rule went into effect in the American League. Hale is therefore remembered as a pinch hitter and part-time first baseman. He batted in 376 games, but played the field in just 120. 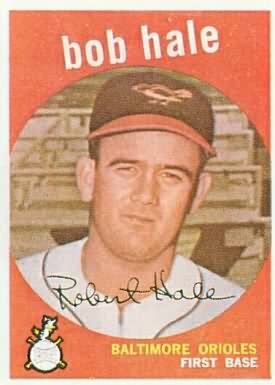 In seven major league seasons with the Orioles, Indians, and Yankees Hale compiled a .273 career average. He batted most in 1956 when he dug in next to home plate 223 times. It was the same year he hit his only home run for the Birds, the first of two career long balls in 670 plate appearances. Hale homered on July 21, 1956, in a 4-3 loss to the Cleveland Indians at Memorial Stadium. Hale’s third-inning solo shot off Hall of Famer Bob Lemon extended an early Orioles lead to 2-0. Nevertheless, Lemon stuck around for all nine innings in Baltimore and earned the 12th of his 20 victories during the 1956 season. It was the seventh and final time in his career that Lemon won 20 or more games. Lemon also led the league in complete games for the fifth and final time of his career. Lemon allowed an average of 0.6 home runs throughout his 13-year career. Players to never homer off him included Hall of Famers Nellie Fox (150 plate appearances), Enos Slaughter (43), Bobby Doer (41), and Joe DiMaggio (24) as well as All Stars Billy Goodman (109), Harvey Kuenn (78), Dom DiMaggio (68), and Johnny Pesky (65). Clearly Hale wasn’t intimidated by a Hall of Famer, perhaps because he came up with one. Hale played on the 1955 York White Roses team with 18-year-old rookie third baseman Brooks Robinson. Robinson made his major league debut on Sept. 17, 1955, after batting .331 with 11 home runs in 354 at-bats with York. Hale, 21, got the call earlier in the season after hitting .355 with 12 home runs and eight triples in 248 at-bats. He debuted with the Orioles on July 4, going 1-4 with a walk. Hale recorded his first major league hit off Dean Stone in a 6-2 Orioles victory over the Washington Senators. Hale’s second of two career home runs came in his final season on Sept. 6, 1961. Playing for the Yankees, Hale homered off Baltimore native and University of Maryland graduate Roy Heiser. Heiser, a 19-year-old righty, played three games for the Washington Nationals in 1961. This entry was posted in Orioles history, Solo Shots. Bookmark the permalink.